This exquisite antique art deco 14K yellow gold brooch is topped in platinum and prong set (10 yellow gold prongs) with a beautiful royal blue oval sapphire weighing approximately 1.6 carats and bead and bezel set with 152 lovely old European cut diamonds with an approximately additional total weight of 5.36 carats. The largest of the diamonds weighs approximately 70/100 carat. The body of the piece measures 2 1/4 inches from top to bottom and 1 7/8 inches from side to side. The back of the brooch has a swivel at its top which when turned up allows for a chain so that the piece can be worn as a necklace as well. 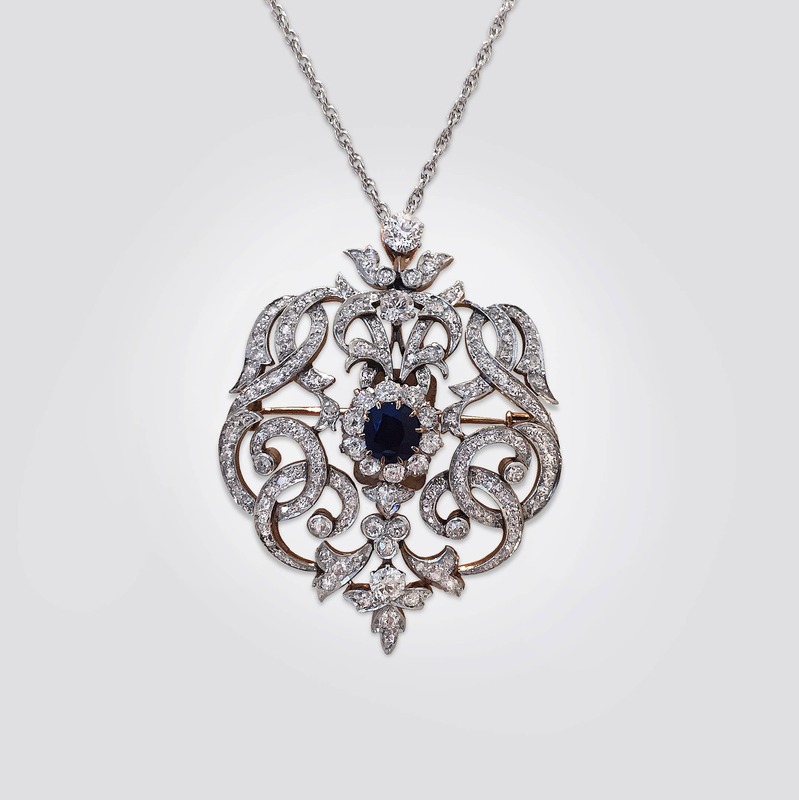 This gorgeous piece of jewelry was made by hand in the 1920's and exhibits superlative craftsmanship and quality of materials. The handmade rope chain measures 18 inches long inclusive of a lobster claw catch; it has an additional stop at 16 inches so that it can be worn long or short, giving this piece additional versatility. The chain is sold separately and is priced at $495.